At Hackensack University Medical Center’s Department of Urology, our specialists provide expert surgical treatment for benign and cancerous adrenal gland tumors. In addition to providing the most advanced surgical care, our highly trained and experienced urologists are authorities on adrenal gland tumors. As a result of their continued study and innovation in the field of adrenal gland surgery, our urologists have been selected to write several book chapters that appear in premier urology textbooks used to train medical students around the world. Our adrenal gland specialists use the latest robotic and laparoscopic technology, including the da Vinci Xi® Surgical System, to perform minimally invasive procedures to treat adrenal gland tumors. Our minimally invasive surgical technology gives our urologists the control and precision required to treat adrenal gland tumors through small incisions without damaging nearby organs, tissues, and structures — which may result in a faster recovery, less pain, and a lower risk of complications after surgery. Our urologists also work closely with endocrinologists to diagnose and treat adrenal gland tumors. Because your adrenal glands play a critical role in your body’s hormone production, our urologists perform adrenal gland-sparing surgery whenever possible to preserve the natural function of your adrenal glands. Adrenal gland tumors can be cancerous (malignant) or non-cancerous (benign). Although some adrenal gland tumors are discovered by accident during an imaging test for an unrelated health problem, adrenal gland tumors are sometimes diagnosed because they are causing noticeable symptoms due to excess hormone production. If your doctor suspects that you may have an adrenal gland tumor, he or she will refer you to an endocrinologist for a complete examination, which may include imaging, blood and urine tests. These tests will determine whether your adrenal gland tumor is malignant or benign, and whether it is producing excess hormones. Some small, benign adrenal gland tumors do not require surgical treatment and can be monitored or managed with medication to control hormone levels. If your adrenal gland tumor is large, cancerous, or producing excess hormones, it may need to be removed by an adrenal gland surgeon. Our Urologists are fully accredited and are highly trained. They are here to fulfill your needs and make your visit more than satisfactory. The urologists of Hackensack University Medical Group (HUMG) are a subgroup within the Department of Urology at Hackensack University Medical Center. This faculty practice is the backbone of academics, research, and education for the Department of Urology. The surgeons at Hackensack University Medical Center are among the best in the region at adrenal gland-sparing surgery that preserves normal adrenal gland function. Total adrenalectomy. During a total adrenalectomy, your surgeon will remove your entire adrenal gland. Your doctor may perform a total adrenalectomy if your adrenal gland tumor is large or cancerous. In some cases, your doctor may remove your adrenal glands as part of a radical nephrectomy to treat kidney cancer. Open surgery. During open surgery, your doctor will remove your adrenal gland tumor through a long incision in your abdomen. Your doctor may recommend open surgery if your adrenal gland tumor is large, or if you have other conditions that may make minimally invasive surgery difficult. Laparoscopic surgery. During laparoscopic surgery, your doctor will make several small incisions in your abdomen or back and insert an instrument called a laparoscope, which is a thin tube with a camera on one end. Your surgeon will remove the tumor by inserting small instruments through the laparoscope while using the image from the camera for guidance. Robotic surgery. During robotic surgery, your surgeon will sit at a special console and control robotic arms that hold a camera and tiny surgical instruments, which will be inserted into small incisions in your abdomen. Your surgeon will use the image transmitted from the camera to the screen on the console to guide the surgical instruments. Robotic surgery improves surgical precision and dexterity, which allows your surgeon to maneuver in small spaces and remove adrenal gland tumors without damaging nearby structures and organs, including your kidney, spleen, liver, vena cava, aorta, and duodenum. 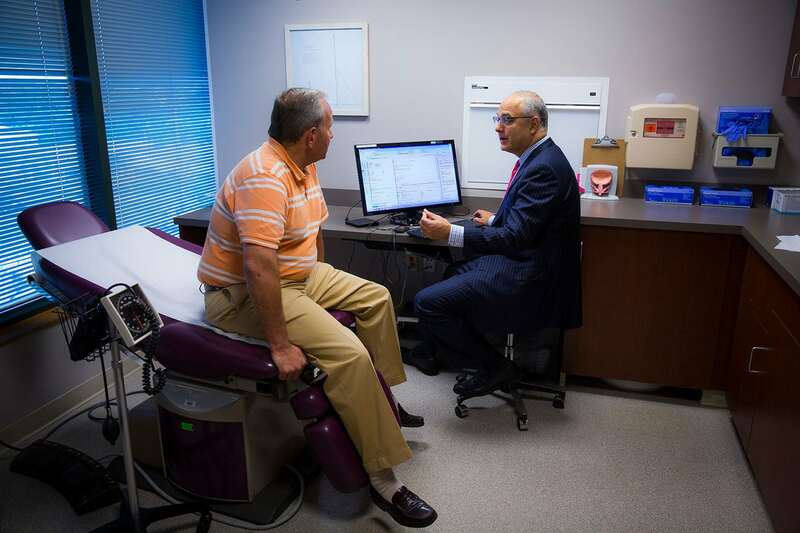 The urologists at Hackensack University Medical Center understand that men have unique needs when it comes to urological care. Our urologists provide expert, compassionate care for all urological conditions—from common issues to the most complex problem.